I come back today to some photographs that my wife Oksana Mysina took when she was recently in Prague to participate in a documentary film about Marina Tsvetaeva. The photos are wonderfully evocative. 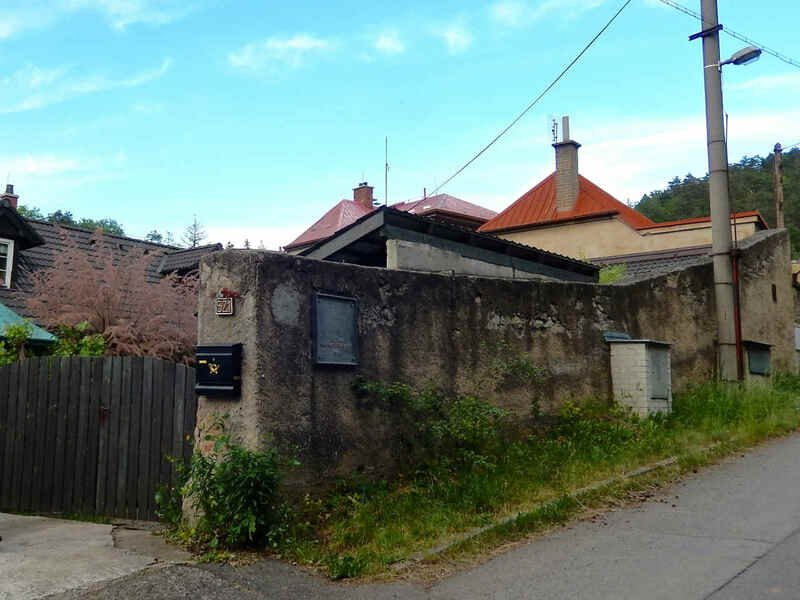 Even though there isn’t all that much left from the time when Tsvetaeva lived here in the village of Všenory with her husband Sergei Efron and her daughter Araidna, there is more than enough to trigger thoughts. 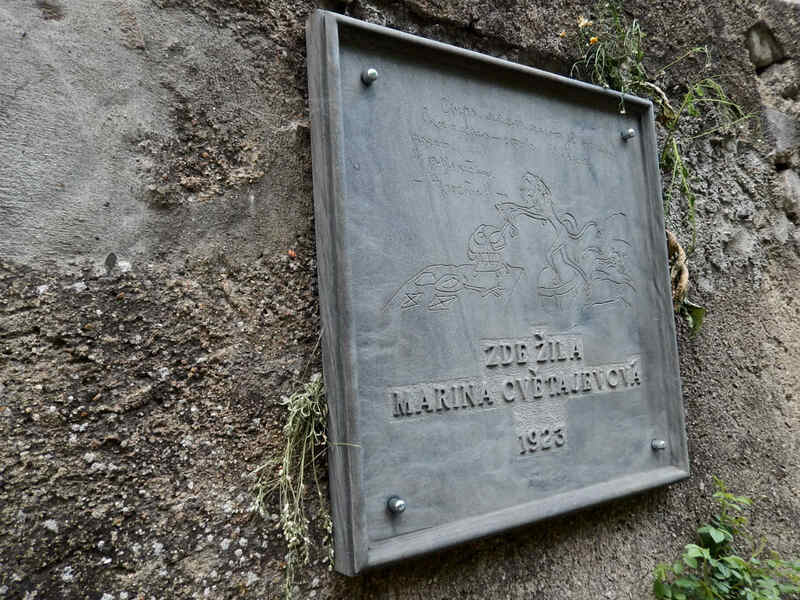 Primarily what is left are the old wall on which a plaque was erected in honor of Tsvetaeva in 2012; the little green side house which stood next to the building (now gone) where the family resided; perhaps a garden gate; and the steep slope across the road from the residence. In the last photos below you can see the road leading up to and down to the Tsvetaeva site, with the slope across the way. There are many confusions about this place and this time. I was all set to speak of Všenory unquestioningly, until I ran across a note on a Tsvetaeva page on LiveJournal reminding us that there were two Všenorys, Všenory I and Všenory II. 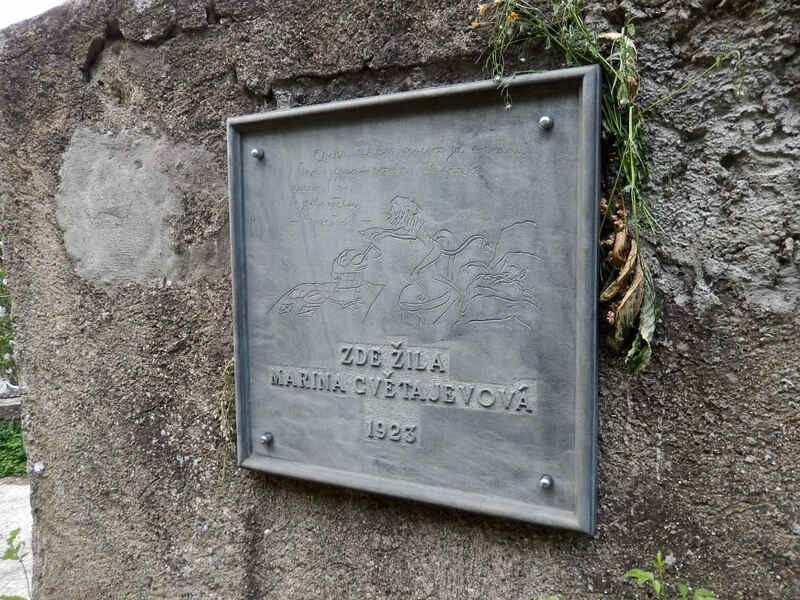 It was in the latter that Tsvetaeva and family lived from November 1922 to August 1923. 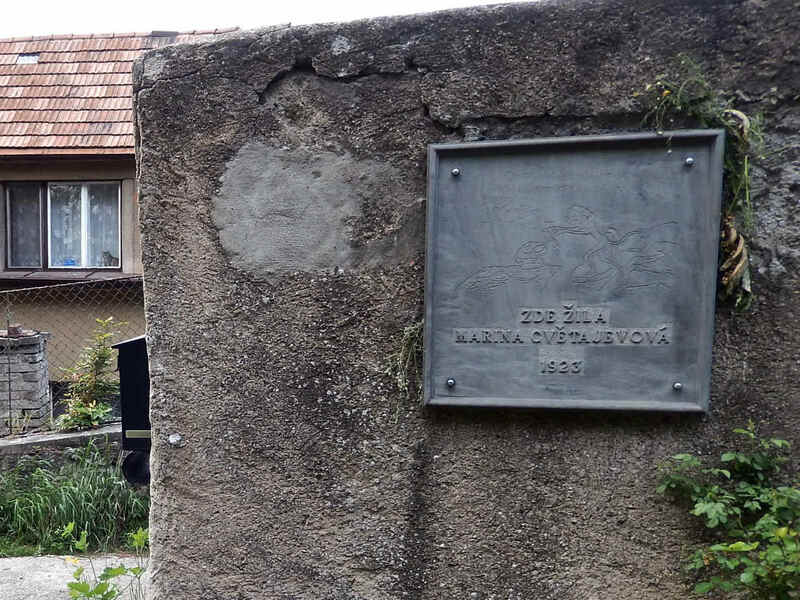 As the author, Ellenai, points out, one should not mistake this Všenory with the Všenory (Všenory I) that the family moved to in 1924, where Tsvetaeva gave birth to her son Georgy. If you are to look for this location today, you must seek 521 V Chaloupkách. However, at the time Tsvetaeva lived here it was 33 Horni Mokropsy. 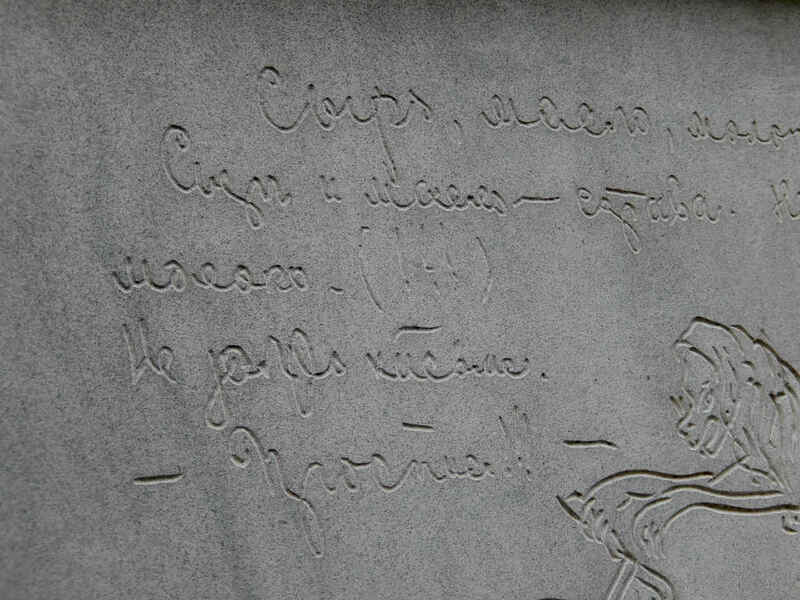 In a letter to a friend, here is precisely how Tsvetaeva gave her address: New address: Praha P.P. 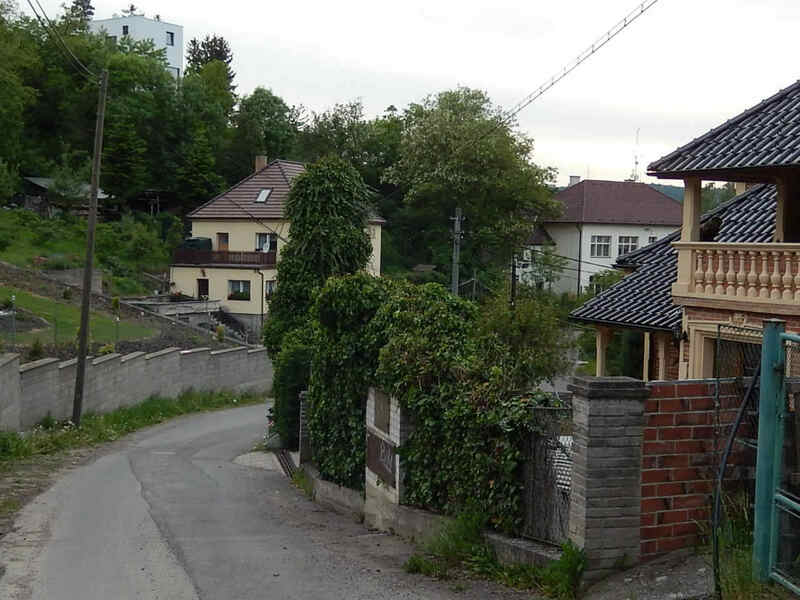 Dobřichovice, Horni Mokropsy, čislo 33, u Pana Grubnera — to me, name of Efron. Dobřichovice would appear to be the train station nearby. Is Horni Mokropsy the name of the village or the name of the road? Or maybe both, since the place was so tiny. Pan Grubner’s home, where the Tsvetaevas occupied one of three rooms, was the last building on the street at that time. Tsvetaeva wrote some important works here, including Poem of the End, and she apparently began her tragedy Theseus-Ariadne here. The implication is that this text refers to Tsvetaeva’s time living here in Všenory a/k/a Horni Mokropsy, but our friends at LiveJournal once again throw shade upon this assumption. In short, this kind of stuff is right up my alley. As my old friend Volodya Ferkelman would say, “The devil himself will break his leg” on this one. Take a look at the middle photo below. 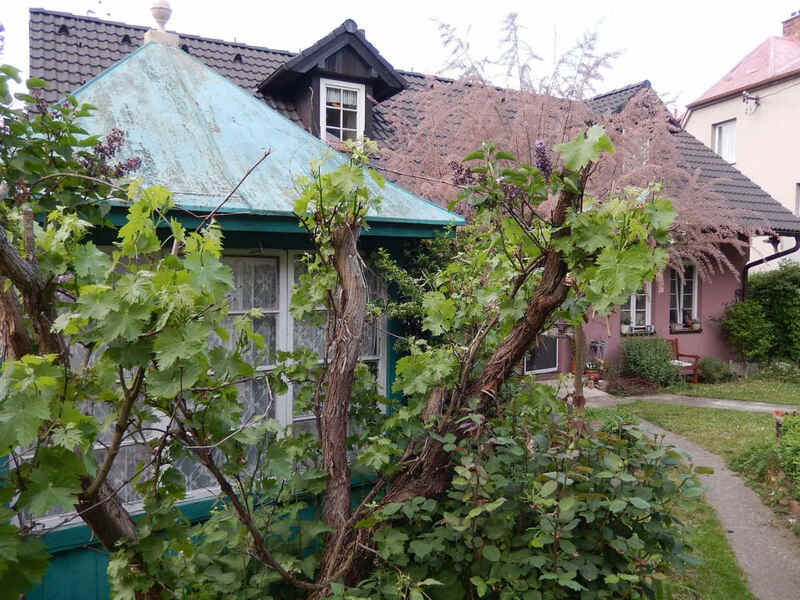 The pinkish house in the background behind the green structure (which, as I said, is an original from that time) is where the Tsvetaeva/Efron house was located. 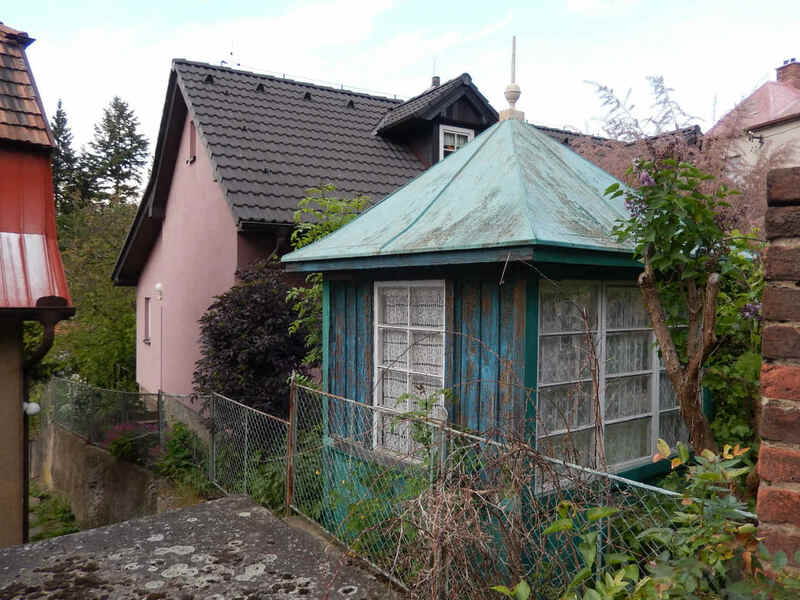 I cannot determine without a doubt whether the orginal house has been torn down and replaced, or whether it has just been renovated and expanded. In any case, this little view offered by Oksana’s photo is one that approximates what Tsvetaeva might have seen when coming home lugging pails of water. 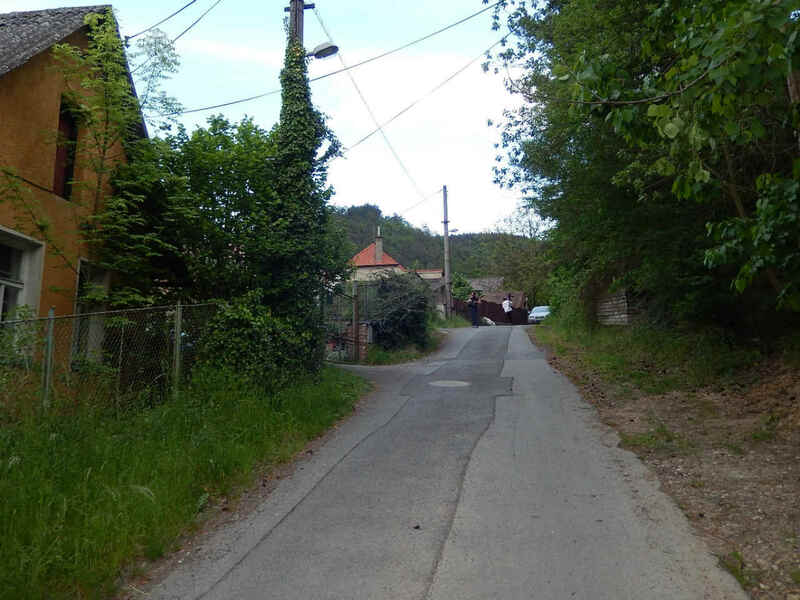 According to Czech Wikipedia, Horní Mokropsy [Upper Mokropsy] is the eastern part of Všenory village. I suspect it was so tiny they just gave each house there a number, without bothering about street names (did a remote lane in a tiny village even have an official name at the time?). Fascinating post, as always; I recently read Viktoria Schweitzer’s biography of Tsvetaeva (or Cvetajevová, if one is Czech), so this was of particular interest to me. Thank you for that clarification. I, frankly, got a bit lost as I attempted to straighten out what was what. You’ve shed some good light on it!